We are the CFO Squad! Founded in July 2013 by Joseph Himy, the CFO Squad is an accounting consulting firm which offers CFO-level talent on an outsourced and cost effective basis. The CFO Squad was created with a dual purpose: to assist public companies with the ongoing responsibilities of being a public entity and to help private companies achieve public status. The company has expanded to include a multitude of additional services—servicing the private sector, providing tax services, investment banking, mergers and acquisitions and quality of earnings. In the last year alone, our company has grown at a rate of 75% of revenues and we anticipate meeting our goal of continued growth of 25-30% this year. We are gaining market recognition through our quality of work and pride ourselves on adding value to the companies that we work with. We look forward to expanding our company in the area of part-time CFO work and meeting our future growth plans. Using our propriety reporting system and model that was developed for our SEC clients, we assist bankers and clients looking to sell to organize the data and prepare the required financial statements. We excel at assisting companies who have never filed tax returns or issued financial statements. We successfully manage and organize the data and walk the company through the pre-audit and first time audit process. We develop long-term relationships with our clients and concentrate on developing an organized and effective accounting system that allows them to function efficiently. The CFO Squad is a leading financial and business advisory firm providing outsourced accounting & consulting services for emerging to mid-sized companies. We empower our clients with financial solutions uniquely suited to their needs; we add value to our clients’ businesses by streamlining their financial and management systems; and we encourage independence by teaching our clients’ personnel skills to better accomplish their tasks. 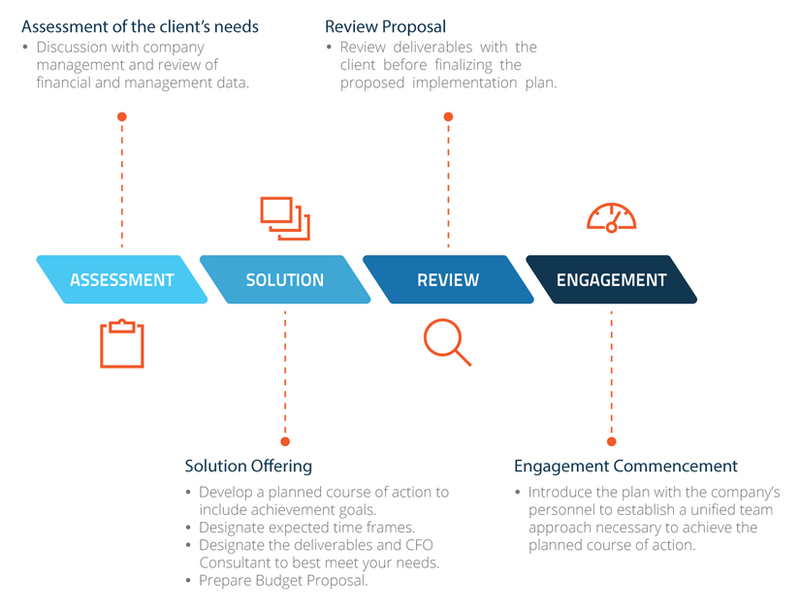 Your CFO consultant will commence and complete the project within the expected time-frame. They will provide you with a written weekly progress report and communicate with key business leaders on a regular basis. During this stage we also train your personnel as necessary to enable them to implement any tools and processes introduced. The proactive approach brings additional value to our client’s business and enables our clients to become more independent, successful and profitable overtime. How do we maintain our quality performance? We possess a high commitment to quality. We provide personal and detailed attention. Our personnel are dedicated employees, not independent consultants. We have access to extensive resources: legal and professional. We customize our proprietary financial solutions to each client’s needs. We maintain clear and consistent communications. Our team members possess legal backgrounds and a strong understanding of SEC regulations and compliance. We are virtual and therefore available and accessible to our clients’ needs at any time.